Lawn Crew – Advice on cutting and watering your lawn in Surrey. 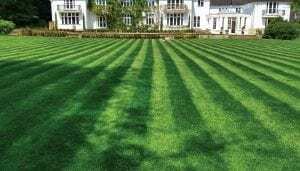 Throughout the years of caring for our clients’ lawns in the Surrey area we have noticed a vast difference in lawn health and appearance in those lawns that are cut using these key rules as a benchmark. Our general recommendation is to keep your lawn at a height of 25 mm – 40 mm (about 1 inch to 1.5 inches). Of course every lawn is different and should be treated as such, however, this is a good benchmark for a domestic utility lawn. If areas of your lawn are in constant shade or little light it’s better to raise the height to allow more grass blade on show for photosynthesis. A lawn that is cut too short will become thin and invite opportunity for weeds and moss to take a foothold, a lawn that is cut too long will become leggy, look untidy, and encourage moss and disease. Aside from checking the owner’s manual, the most effective way to check the height settings on your mower is to place your mower on a flat hard surface, such as a patio, with your mower off and spark plug or battery removed place a stick inside the housing, try and find the lowest point of the mower blade and place the stick on the hard surface below the blade. Mark on the stick where the mower blade reaches and measure the distance using a ruler or tape measure. The lowest setting on the mower isn’t necessarily the correct one – each mower is different and it’s important to know what height you’re cutting at. It’s best to start high and work your way down if you’re unsure. To prevent stress it is really important that only 1/3 of the lawn height is cut each time. If due to conditions or time constraints the lawn gets long I advise slowly reducing the height of the cut over a week or two. Removing more than 1/3 of the blade length will thin out the sward leaving it vulnerable to moss, weeds, and in some instances, weaken the lawn against disease. The best greens are only cut a few mm a day. Little and often is the best approach when cutting a lawn. A lawn that is regularly cut little and often will be in far better condition than a lawn that is cut infrequently and with more than 1/3 removed each time. Increasingly we’re seeing clients with robotic mowers. The robotic mower is out cutting the lawn 3-5 days a week come rain and shine, the results are impressive. Not only is the lawn being cut little and often but the grass clippings get mulched back into the lawn – free food and no waste! The domestic lawn typically has a mixture of grass types and cultivars. Some grasses including the bents and fescues create stolons and runners – these can cause quite an issue if a lawn is always cut in the same direction. You might have noticed your lawn looking thin and ‘leggy’ and can’t understand why. This is quite common, we see this in lawns where the direction of the cut isn’t alternated. Overtime, instead of growing vertically, the lawn starts to grow horizontally in the direction it’s being pushed down by the mower – know as ‘graining’. Horizontal growth causes an issue where the grass plant gets long and the lawn becomes thin – no matter how low you try and cut the lawn it won’t take enough of the height off. By alternating direction 45 or 90 degrees on each cut e.g. from north/south to east/west or diagonally each time will keep the grass growing vertically encouraging it to tiller and thicken. Dull blades will tear the grass plant making your lawn susceptible to disease and dulling the colour. I regularly get asked to diagnose issues with prospective clients’ lawns where a lawn with a better colour is desired. It immediately becomes obvious that the mower being used to cut the lawn has dull blades. Sharpening or replacing the mower blades will instantly bring vigour back to the lawn. I would recommend changing or sharpening your blades at least once every 6 months. It’s useful to have at least one spare mower blade in case you catch a root or buried object in the lawn, or if you don’t sharpen your own blades.